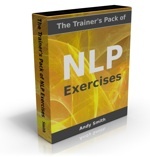 You are here: Home / All / NLP applications / Training and presentation tips: which way is your audience’s future? Observe anyone talking for a while and you will probably notice that when they talk about an event in the past, they gesture in a particular direction, and when they talk about the future, they gesture in another direction. Usually this will be to their left for the past, and their right for the future. In Western culture at least, it seems like we are used to thinking of time as running from left to right. Look at any graph with time as one of the axes – the time axis will be running from left to right. This is one of the most common directions that people’s ‘timelines‘ – their unconsciously held spatial metaphor for thinking about time – runs, the other commonly-found direction being “future=forwards, past=backwards”. So when you are presenting, or speaking in public, you might unconsciously gesture to your left to suggest the past, and to your right when talking about the future – unless you think about it. Because from your audience’s point of view, your left and right gestures are reversed – so when you gesture right to suggest your future, perhaps when talking about goals, you’re actually indicating ‘past’ to your audience. So, next time you give a presentation or run a training course, what if you try out reversing your time-related gestures? That way, when you talk about the future, you’ll be aiming the attention of your audience to where the future feels like to them. They won’t even consciously notice the switch, but it will just be that little bit easier for them to understand what you are saying, without them having to spend mental energy adjusting for a reversed timeline. It will require conscious thought at first, and seem strange, and some of the time you may forget to do it. But pretty soon it will be easy and natural, and the switch of timeline will happen automatically as soon as you stand in front of an audience. You may also want to experiment with what happens when you use this gestural switch in one-to-one conversation as well. Bonus tip: you can also use the “future=forwards, past=backwards” with an audience. Peter Freeth, an NLP business consultant, told me that he often starts corporate courses by asking participants what they expect the workshop to be like. Sometimes, if participants are being honest about their expectations, there will be replies like “boring”, “waste of time” etc. Peter starts writing these on a flipchart, and when he gets about halfway down the page he tears it off the chart, wads it into a ball, and throws it over the audience’s heads so it lands behind them – metaphorically, in their past, so it’s easy for them to forget about it. He then writes up their more positive wishes for what they want the workshop to be like – and leaves them up there. Part of how I use the “front of room = future; back of room = past” spatial metaphor: if we’ve been discussing anything we want to move away from, I write it on a flip chart and post it at the back of the room. I often even say, “Let’s put this behind us” as I do so. In contrast, flip charts relating to desired behaviour and other goals get posted in the front half of the room, so they’re within participants’ peripheral vision.